In my opinion, nothing is cooler this summer than a worn-in pair of Denim Shorts. For Spring 2014, Denim was not so much about the wash, but in DIY, and jeans were finished with prints, embellishments, doodles, splatters, and patches. For Summer, it makes sense that these trends get translated onto overalls and cut-off Denim Shorts. 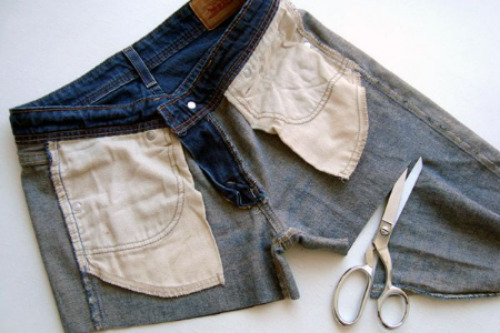 I love DIY, and cutting off your kids grown-out and too-short jeans into Denim Shorts and patching, shredding, or embellishing them yourself. But there are also a lot of cute Denim Short options to buy your little one with patches, rips, and embellishments. Whatever you choose to do, DIY or buy your child a pair, here are my favourite options that will give your little one Swag this Summer, and can be worn anywhere... from the beach, to the park, in the city, or at Summer camp! In fact, I love this trend so much I am either going to DIY a pair of my old bootcut jeans into cut-offs, or I am loving these cool slouchy boyfriend options | Zara DENIM BOYFRIEND BERMUDAS | DL1961 Corie Rolled Shorts | CURRENT/ELLIOTT THE SLOUCHY CUT-OFFS. These H&M Denim Shorts are washed denim with heavily distressed patch details, and are very cool! These Zara PRINTED DENIM SHORTS have distressing and cool palm print on the rolled-up cuff and inside the Shorts. These Ralph Lauren Camo Shorts have all over rips and repairs with camouflage-printed patches. These cut-off Shorts have a light-wash and vintage-inspired cotton denim. These H&M Denim Shorts are 5-pocket Shorts in washed denim with distressed details. These Zara DENIM SHORTS WITH APPLIQUE have a light wash, distressed details, and a very pretty floral appliqué. These Zara DENIM BERMUDA SHORT WITH SIDE APPLIQUÉ have worn-in wash, skinny leather tie belt, and side lace appliqué. At myfashavenue.com these photos are posted to show you how to turn an ordinary pair of jean shorts into side lace appliqué embellished Denim Shorts. I love these, and want to make myself a pair! At refinery29.com DIY goddess Daniela Jacobs, shares how to create three styles of cut-offs from three old pair of denim jeans she had. Now grab those shears!